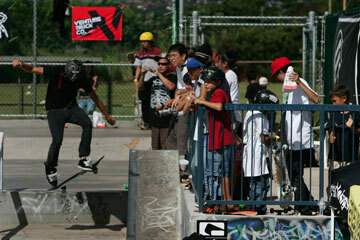 Austin Titterington, left, performed a trick in front of skate fans of all ages during yesterday morning's Skate Halloween Havoc at Manana Skate Park in Pearl City, where skateboarders and skateboarding enthusiasts gathered for a day of competition, fun and prizes. 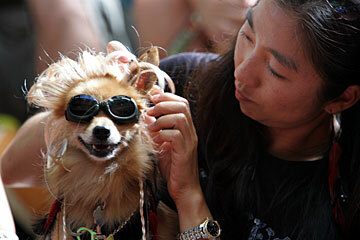 Shadow, a 5-year-old Pomeranian/longhair Chihuahua mix, won first prize for most local costume, dressed as Dog the Bounty Hunter. 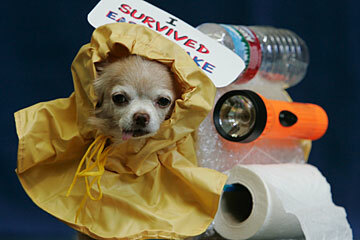 Her owner, Reyna Miyashiro, prepped the costume before the contest. 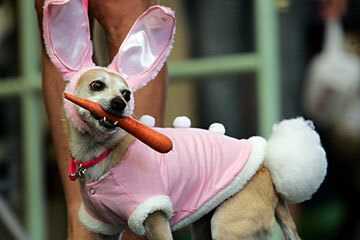 Cheris, a 6-year-old Chihuahua/terrier mix, won first prize for cutest costume. Coco, an 11-year-old longhair Chihuahua, won first prize for original costume, dressed as Miss Earthquake Prepared, yesterday at the Hawaii Doggie Bakery 7th Annual Doggie Howl-O-Ween Canine Costume Contest at Ward Warehouse.